"The main street of Silver City, New Mexico, is a drainage channel that was originally two or three feet lower than the adjacent ground. In 1887 this channel began to deepen, bridges were built for the crossing and a wooden drop structure was constructed to prevent further headward cutting. This drop structure was carried away in a flood about 1892 and erosion proceeded until, in 1917, the channel was over one hundred feet wide and thirty-seven feet deep. Numerous buildings have been carried away in the progress of this erosion (Olmstead, 1919)." An arroyo is a nearly vertically walled, flat floored stream channel that forms in fine, cohesive, easily eroded material. Arroyos can cut as deeply as 20 meters (65 feet) into the valley floor, are often wider than 50 meters (165 feet), and can be hundreds of kilometers long. Arroyos exist throughout the western United States, but are most common in arid and semi-arid climates in the Southwest. The rapid widening and deepening of arroyos have both changed the physical environment and been a costly nuisance in the west since settlement began in the mid 1800's. The most recent period of arroyo formation in the southwest, which occurred from about 1865 to 1915, was not unique. Previous cycles of arroyo cutting (erosion) have occurred at about 2000 years Before Present (B.P.) and 700 years B.P. (Emmett, 1974). These cycles of arroyo cutting were both followed by slower periods of filling (alluviation). Since about 1915, arroyo development, with a few notable exceptions, has slowed with many arroyos showing aggradation (Cooke and Reeves, 1976). The primary modifications since this time have been widening of trenches, grading of walls, aggradation, and slow changes in bed levels. Three factors may cause arroyo formation, but the relative contribution of each is difficult to discern. The main factor is thought to be a change in climate that produced unusually heavy rainfall. Land-use practices, such as grazing, may have enhanced arroyo formation in the southwest during the most recent period of erosion (A.D. 1865-1915). A natural cycle of erosion and deposition caused by internal adjustments to the channel system is a third possibility (Graf, 1988; Schumm and Hadley, 1957). Flooding caused by heavy rain may produce arroyos. Although climate records in the southwest were not systematically kept before about 1900, recent studies have found evidence for unusually heavy rainfall in Tucson, Arizona during the late 1800's (Betancourt and Turner, 1993). This rainfall was caused by strong and frequent ENSO (El Nino Southern Oscillation) events, suggesting that heavy rain was a regional phenomenon. Thus, the climate of the Southwest during the most recent period of arroyo entrenchment was conducive to large floods (Hereford, 1993). Drainages may have been especially vulnerable to arroyo cutting, if unusually wet ENSO conditions occurred immediately following a period of below normal precipitation. During a dry period, the enervated vegetation would not have its normal capacity to protect the soil from rain-drop impact or to absorb and slow runoff. With the settlement of the West came the rapid introduction of cattle, sheep, and horses. From 1870 to 1890 the number of livestock in New Mexico increased from 300,000 to 2,300,000 (Peterson, 1950). Similar increases were reported in other Western states during this time. Valley floors, which were the most dependable forage areas for the animals, were quickly overgrazed. The fragile vegetation was consumed, and the soil was compacted and left extremely susceptible to erosion. To further exacerbate the soil conditions, both humans and livestock created trails along stream channels and nearby hillsides forming small ditches, leaving the land surface susceptible to arroyo formation. Nevertheless, earlier periods of arroyo formation predated the introduction of livestock, and thus overgrazing cannot be solely responsible. Spanish and Mexican ranchers, moreover, introduced large numbers of livestock in the 1700's without associated erosion. For these reasons, other factors such as climate change may have played a more important role in arroyo formation. A third explanation for arroyo development involves external forcing and climate change as triggering mechanisms for incision. This theory postulates that the system has to be in a state ready for incision and involves random, heavy rain and flood events along with internal adjustments in the channel system. If a cloudburst occurs over a drainage, it may deeply erode a single channel, leaving hanging valleys where tributaries enter. Future runoff through the tributaries would cause incision at their mouths and arroyo elongation through upstream migration of headcuts (Dellenbaugh, 1912). As sediment accumulates in stream valleys, the gradient of the water course changes. When the slope builds to a critical point, entrenchment may be triggered causing arroyo formation. 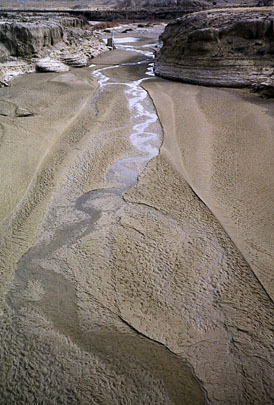 This type of arroyo formation causes the channel to shift laterally across the stream bed with each cycle of incision. An example of this phenomenon is illustrated from the 800-year entrenchment history of Red Creek in Utah based on tree-ring data from trees growing in the flood plain. 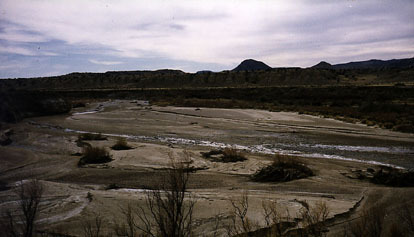 The author concluded that lateral movement of the stream channel in its flood plain was responsible for controlling arroyo development (LaMarche, 1966). While it is arguable which component has contributed the most to arroyo formation in the Southwest, it is widely accepted that climatic events, human settlement and land use, and naturally occurring internal adjustments in drainages are probable causes. The temporal coincidence of the causes may have magnified the effect of each factor. Observations before 1865 describe verdant river bed marshes, known as cienegas, containing beaver ponds, fish, and tall grasses which were nourished by high water tables (Bryan, 1925). These marshes have since been drained by arroyos, altering the flora and fauna of the area by widening and deepening the original stream channel. Arroyo formation can be very destructive to agriculture. As soon as arroyo cutting begins, the surrounding water table is lowered making irrigation difficult. Arroyos can quickly remove as much as 25% of their valley floor (Cooke and Reeves, 1976, p. 3), covering downstream agricultural land with unwanted flood-borne sediment. This sediment does not improve the fertility of the underlying alluvial soil because it contains large quantities of sand and gravel that originate from subsoils and deposits of soil forming materials (Cooperrider and Hendricks, 1937). 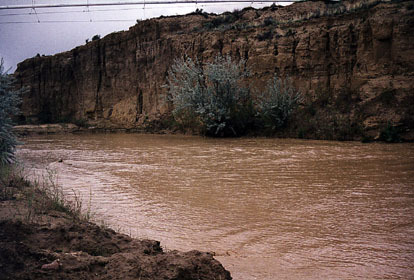 The often excessive deposits of sediment from upstream arroyo formation can decrease flood protection by reducing the natural regulatory functions of stream channels. Sediment from upstream arroyo erosion fills channels that otherwise would store flood water. Arroyos also increase flood severity by changing the geometry of the stream channel. Development of an arroyo in a previously braided or meandering drainage straightens and shortens the channel which limits flood water dispersal and increases velocity. Because of the loss of land to arroyos and the increased difficulties of farming, humans have occasionally been forced to either change their agricultural practices or to relocate. Where cropping had depended on irrigation, problems of increasingly fluctuating and decreasingly reliable water sources, and difficulties of transferring water to fields, drove out farmers or forced a change to grazing (Gregory and Moore, 1931). Other damages include destruction to roads, railroads, bridges, culverts, fences, and irrigation works. In the late 1880's, the entrenchment of the Rio Puerco in New Mexico forced the desertion of the towns of San Ignacio, San Fernando y Blas, and San Francisco (Bryan, 1925). Prehistoric arroyo cutting may have been one of the main factors leading to abandonment of southern Utah and northern Arizona by the Anasazi (Hereford et al., 1995). Attempts to mitigate damage from arroyo cutting date back to the Civilian Conservation Core in the 1930's when attempts were made to slow the erosion of headcuts and banks by reducing grazing and installing control structures. Livestock growers, although fully conscious of the erosion menace, are generally not convinced that their herds are responsible for erosion or that their removal will effect a cure (Peterson, 1950, p. 425). In one study, isolated tracts of land near arroyo banks were fenced to keep livestock out to promote revegetation. The results varied widely. In some locations, the increase in vegetation stabilized the arroyo walls, whereas in others recovery was insignificant (Peterson, 1950, p. 426). Other methods of erosion control involve tree planting along banks, the introduction of debris into the channel to slow the flow, and the construction of spreader dikes to catch silt. Unfortunately, such erosion controls are costly. There is no known solution to the arroyo problem. Further research is needed to better understand the rapid and often destructive erosion caused by arroyos in the Southwest. To better conserve soil, we must continue to study the effects of land use practices on arroyo formation and develop efficient and cost-effective erosion control methods. Finally, we must work to model and forecast the effects that future climate change may have on arroyo development. Betancourt, J.L., and Turner, R.M., 1993, Tucson's Santa Cruz River and the Arroyo Legacy: University of Arizona. Bryan, K., 1925, Date of channel trenching (arroyo cutting) in the arid southwest: Science, v. 62, no. 1607, p. 339. Cooke, R.U., and Reeves, R.W., 1976, Arroyos and environmental change in the American South-West: Oxford, Clarendon Press, 213 p.
Cooperrider, C.K., and Hendricks, B.A., 1937, Soil erosion and stream flow on range and forest lands of the Upper Rio Grande watershed region in relation to land resources and human welfare: US Department of Agriculture. Dellenbaugh, F.S., 1912, Cross-cutting and retrograding of stream beds: Science, v. 35, p. 656-8. Emmett, W.W., 1974, Channel aggradation in western United States as indicated by observations at Vigil Network sites: Zeitschrift fur Geomorphologie, v. 2, no. 3-5, p. 53. Graf, W.G., 1988, Fluvial processes in dryland rivers: New York, Springer-Verlag, pg. 223 p.
Gregory, H.E., and Moore, R.C., 1931, The Kaiparowits region, a geographic and geologic reconnaissance of parts of Utah and Arizona: U.S. Geological Survey 164, pp. 33-35. Hereford, R., 1993, Entrenchment and widening of the Upper San Pedro River, Arizona: Geological Society of America 282. Hereford, R., Jacoby, G.C., and McCord, V.A.S., 1995, Geomorphic history of the Virgin River in the Zion National Park area, Southwest Utah: U.S. Geological Survey 95-515. LaMarche, V.C., 1966, An 800-year history of stream erosion as indicated by botanical evidence: U.S. Geological Survey 550-D.
Peterson, H.V., 1950, The problem of gullying in western valleys, in Trask, P.D., ed., Applied Sedimentation: New York, John Wiley & Sons. Schumm, S.A., and Hadley, R.F., 1957, Arroyos and the semiarid cycle of erosion: American Journal of Science, v. 255, p. 163.